Hulu Plus is not just for catching up on this week’s episodes of The Daily Show or binge-watching old seasons of The Real Housewives of Orange County. It’s also home to a huge number of films distributed by the Criterion Collection, a prestige company that since the Laserdisc days of the 1990s has been fulfilling its promise to release “a continuing series of important classic and contemporary films.” And since not every important film was made in the United States (shocking but true), here are 10 of the best international films in the Criterion Collection, all streaming on Hulu Plus. A transformative, transcendent experience. 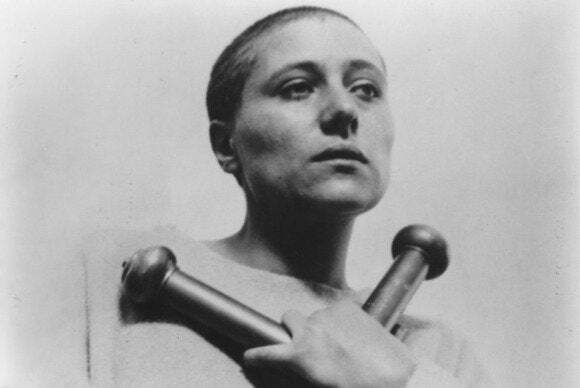 Dutch director Carl Theodor Dreyer started with original court transcripts for his silent-era The Passion of Joan of Arc (1928), telling the story of the mysterious 15th-century teenage French girl who claimed to have been chosen by God to lead troops into battle against the English. He also used strange, daunting close-ups of actors with no makeup, highlighting moles and other facial imperfections on Joan’s accusers. But aside from this realism, Dreyer employed a disorienting technique of never matching two shots in the same space, so that everything seems to be untethered, drifting, like a dream. The movie also used an expensive set that goes largely unseen in the film. But the key to the movie is the beautiful, ethereal performance by Maria Falconetti as Joan—many have called it the greatest performance in the history of film. As she deflects each accusation that comes her way, she seems to have bared her very soul. It’s a film that immerses viewers in a spiritual, intellectual, and emotional space unlike any ever captured on film before or since. Sadly, Hulu has opted to show only the silent version, with no musical accompaniment, but perhaps viewers can come up with their own score. Japanese filmmaker Akira Kurosawa is perhaps the best-known of all international directors, but this is mainly for his exciting, action-packed samurai movies. Those are great, but Kurosawa also made many powerful, contemporary dramas, and none were quite as moving as Ikiru (1952). Fans may recognize star Takashi Shimura from Kurosawa’s Seven Samurai as well as Godzilla; here he plays a big city bureaucrat who learns that he has cancer. He grapples with the fact that his life’s pencil-pushing office work hasn’t amounted to much, and so he devotes his time to building a children’s playground. The image of Watanabe sitting on a swing somehow manages to sum up all the movie’s simple, powerful themes. Kurosawa’s direction here is as gentle as it is energetic in the samurai films, and Shimura gives another of the all-time great screen performances. While American viewers latched onto Kurosawa very easily, his countryman Yasujiro Ozu was a different story. 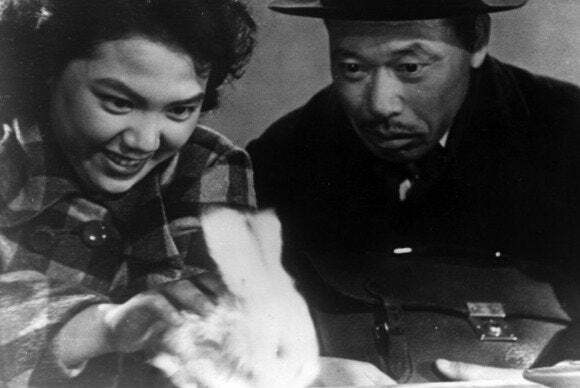 Ozu was one of the wisest of filmmakers and seemed to understand that peace came from acceptance. Yet distributors were reluctant to touch his films for fear that he was “too Japanese.” Thankfully that stigma is gone now, and Ozu’s films have been widely appreciated, especially the masterpiece Tokyo Story (1953). 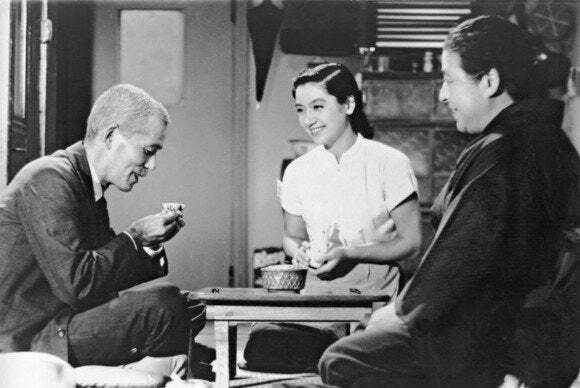 In telling the story of an aging couple whose grown children no longer have time for them, Ozu’s style is patient and serene, set at mid-level, and using long takes. He often includes rest points, or “pillow shots” of various views, such as clotheslines or train tracks, that serve to create a certain languid, Sunday afternoon pace. This is one of those rare movies that could actually change your life (and make you want to call your parents). After World War II, from the ruins of Italy rose a new breed of filmmakers that began making films about the way things actually were; this movement was dubbed Neo-Realism. Perhaps the most famous of these was Federico Fellini. 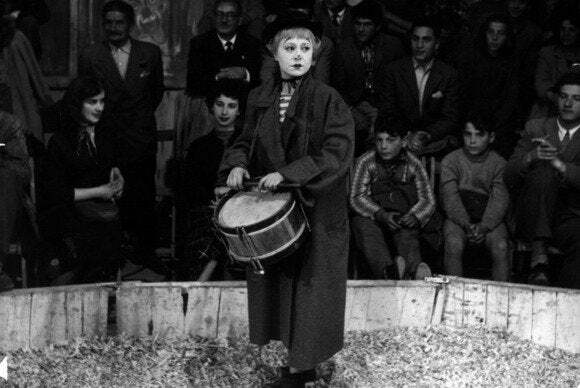 One of his best films, La Strada (1954) saw Fellini breaking away from Neo-Realism and veering into new, more striking imagery. Fellini’s muse Giulietta Masina plays Gelsomina, a poor little waif girl whose mother sells her as an assistant to a brutish traveling circus strongman, Zampano (Anthony Quinn). The strongman treats her miserably, but trains her to be a sweet little clown who dances and passes the hat for money. Richard Basehart plays another circus performer who gives Gelsomina hope, albeit briefly. It’s a sad tale, but filled with Fellini’s passionate images, vibrant beings clashing with desolate spaces, looking for moments of glory. It won the Oscar for Best Foreign Language Film. In France, Robert Bresson was one of the most unique filmmakers in the world, working to get at the human soul through minimalism and purity. He called his actors “models,” because he didn’t really want any acting in the traditional sense. 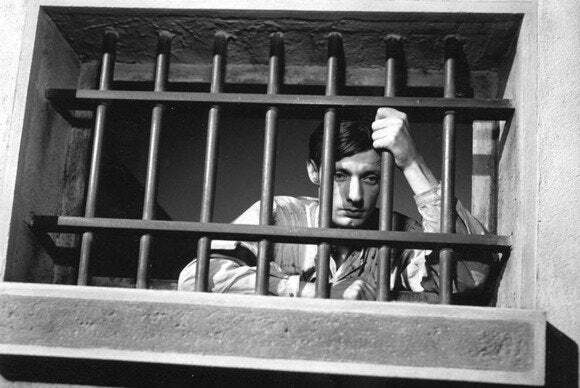 His prison escape movie, A Man Escaped (1956), is a story reduced to its details. A man (Francois Leterrier), alone in his cell, learns to communicate with the outside world, creates tools that create an opportunity, and then creates more tools. The man’s captors, the Gestapo, are never shown, and other prisoners are only glimpsed. Amazingly, without specifically trying to generate suspense, Bresson generates it anyway. And, through it all, comes an existential experience, a meditation on man’s quest for freedom, survival, and salvation. It’s based on a real-life memoir by André Devigny. 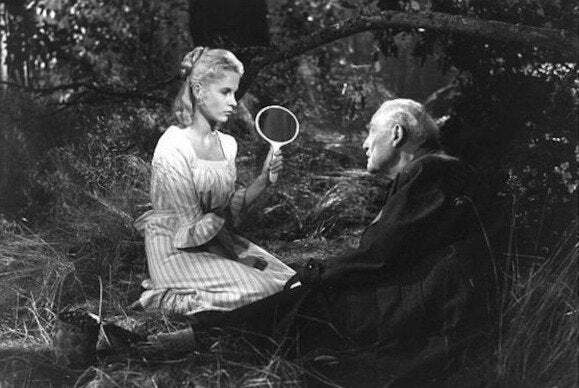 The Swedish director Ingmar Bergman is best known for his arty hit The Seventh Seal (1956), in which a knight plays chess with Death (the scene has been parodied many times), but his follow-up, Wild Strawberries (1957), is even better. It’s a reflective, beautiful, thoughtful, and even hopeful road movie in which an aged professor (Victor Sjöström) travels to accept an honorary degree. Along the way, he meets several fellow travelers, and he finds himself experiencing old memories, daydreams, and even nightmares (the movie contains one of the most haunting nightmare sequences ever filmed). This was the final film of Sjöström, who had been a famous director back in the 1920s, with films like The Phantom Carriage and The Wind. Bergman regulars like Bibi Andersson and Max von Sydow also appear. 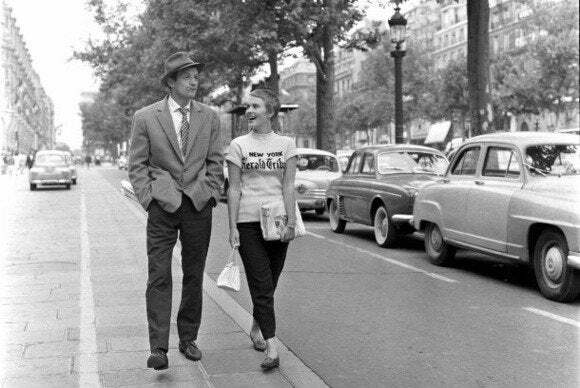 Jean-Luc Godard had been a film critic for the French film magazine Cahiers du Cinema before becoming a filmmaker, and his debut, Breathless (1960), is steeped in movie knowledge. It springs from any number of low-budget B-level Hollywood crime movies, but it’s also one of the greatest debut films in history, and one of the most important, influential movies ever made. Jean-Paul Belmondo stars as a low-rent criminal who fancies himself to be a bit like Humphrey Bogart. After stealing a car and killing a cop, he goes on the run. 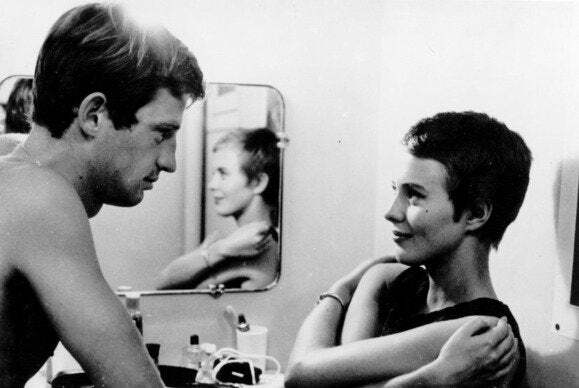 American-born Jean Seberg plays his girlfriend, who hides him for a while, but eventually betrays him. The plot is far less important than the movie’s style, with the now-famous jump cuts and raw, reckless camera style. Packed with layers of stimulating ideas, it plays more like a work of film criticism than a traditional crime drama, though it is both. Filmmaker Jean-Pierre Melville (Le Samourai) has a cameo. Italian director Michelangelo Antonioni made an enormous impact on world cinema with his breakthrough film, L’Avventura (1960). In it, Sandro (Gabriele Ferzetti), his girlfriend Anna (Lea Massari), and her friend Claudia (Monica Vitti), go on a yacht trip. At one point, Anna simply disappears. Sandro and Claudia begin looking for her, but eventually become attracted to one another. 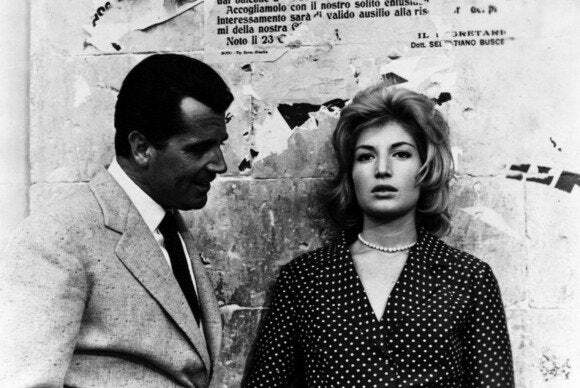 Antonioni doesn’t care of Anna is ever found; his focus is on the general disconnect between humans. He brilliantly used large, empty compositions to illustrate spaces between humans and spaces between objects. Additionally, humans are shown as insignificant compared to the daunting landscapes around them. Just two years later, in 1962, L’Avventura was chosen as the second best film of all time in the respected Sight & Sound magazine poll. It was the first of a trilogy for Antonioni, which included the equally great La Notte (1961) and L’Eclisse (1962). Luis Bunuel was born in Spain, but worked all over the world, in Mexico and France, with a couple of English-language films thrown in for good measure. He is best known for his surrealist short film, Un Chien Andalou (1928), codirected with Salvador Dali, and he kept up that level of playful anarchy throughout the rest of his career. 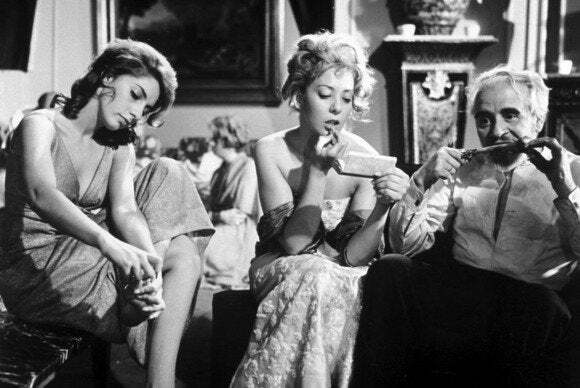 The Exterminating Angel (1962) was made in Mexico with the aid of the great cinematographer Gabriel Figueroa, and it tells one of the most peculiar stories in Bunuel’s remarkable filmography. Simply, the guests at a fancy dinner party find themselves unable to leave. There’s no explanation. Nothing is stopping them. They just... can’t leave. Chaos reigns, with characters fighting, committing unspeakable acts, burning furniture, and breaking through the walls to get to a water pipe. It’s a brilliant way for Bunuel to point out the human foibles of the upper class and the religious establishment, which was one of his favorite activities. 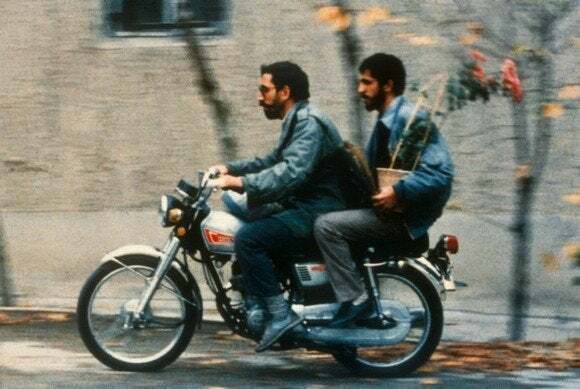 In the 1990s, Iran experienced a kind of “New Wave” of filmmakers, chief among them Abbas Kiarostami and Mohsen Makhmalbaf. Kiarostami won the Palme d’Or for his great Taste of Cherry (1997), but his real masterpiece was Close-Up (1990), a movie not truly discovered in America until its belated DVD release. A self-reflexive commentary on the cinema and on life, Close-Up tells the true story of Hossain Sabzian, a film fan who impersonated Mohsen Makhmalbaf, and was able to move in with an unsuspecting family while pretending to look for a movie location. Kiarostami apparently filmed Sabzian’s trial, went back with the real people and shot a re-enactment of the incident leading up to the trial, and then intercut all the footage into this remarkable film. He ends it with a memorable meeting between Sabzian and the real Makhmalbaf which, in itself, is a strange combination of life and cinema. Though many great films came from Iran, Close-Up is widely considered the best.